For some, sailing in Denmark has everything the Mediterranean has not. The waters are relatively sheltered, yet there is infinite variety. The sun is warm, but not over hot, and the water itself is crystal clear. Top that with a wide range of marinas, services, and you have almost the perfect cruising ground. So what lets it down? The answer is – not much. Compared to some other areas of the Baltic, it has unremarkable scenery – but that's by Baltic standards. Compared to the Med, prices are high and food expensive, but compared to the UK – much is cheap. There are many visitors, but fewer boats than in the UK. Perhaps its best to say that it is different. The West coast of Denmark is of course a different place entirely, but here we shall concentrate on the Baltic Coasts. The North of Denmark has a relatively low lying, shoreline, dotted with small fishing villages. The Skagerrak and Kattegat are about 50 miles wide at this point, so sailing is (relatively) exposed. Once south of Grenå, the coast breaks up into hundreds of islands, and relatively sheltered sailing. 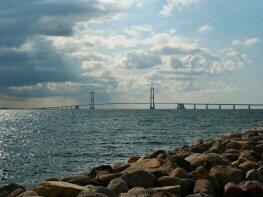 Denmark has three main Islands, (Jylland, Fyn, and Sjælland), with wide ’Sounds’ between them - all of them now crossed by spectacular bridges.The most well known, and most westerly, is the Little Belt (Lillle Bælt). This winding, wooded route has glorious scenery and some lovely fjords and anchorages. Between Fyn and Sjælland is the Støre Bælt (or Great Belt). Finally, between Copenhagen and Sweden, is the Sound (Sund). At its closest, Sweden is about 3 miles from Denmark. Apart from the three main islands, there are hundreds of others, and this is where the true character of Denmark lies. The islands vary in size from a couple of miles, up to tens of miles, and there are usually buoyed channels between them. Just about all towns have marinas. We think the loveliest part of Denmark is Smålands Farvandet and the short cut through between Sjaelland, Falster and Mon to get to Copenhagen. This trip is a must. Although many of the waters are shallow, all the routes are clearly buoyed and navigation is simple. Most marinas are boxes (i.e. Bows to the Quay, with stern tied to posts). Unlike Sweden, there is not a formal system of Guest Harbours, but all marinas will have spare berths marked by the Red/Green symbol. Another surprise is how well you can eat in Yacht Club or Marina restaurants. They may look unprepossessing, but the food is excellent. And don't forget Bornholm – set in the middle of the Baltic – nearer Sweden than Denmark, but with many picturesque little villages. On the pages which follow, we have picked out some places to visit. I'm afraid that these have largely been chosen because we had some suitable photographs, rather than necessarily on their merit as a place to visit, so the choices may seem rather odd, and occasionally grouped in the wrong place. One day, we'll do the area justice.